Welcome Julia Webb, our new Training Programs Manager! Home › Blog and Latest News › Welcome Julia Webb, our new Training Programs Manager! My name is Julia Webb, and I am one of the newest members to join the Fleet Feet PDX team in the role of Training Program Manager. Allow me to introduce myself and give you background of how I arrived here today! My passion for running began after I completed my second 5K as an upcoming senior in high school, way back in 2000 in the great state of Wisconsin. (My first 5K was age 10 - I successfully met my goal - painfully running from start-finish without stopping to walk; only to retire for seven years). I now will shamelessly admit I walk here and there in training and sometimes even races - nothing wrong with that, regardless of my “high level” of ability! I “accidentally” became a runner when I knew my basketball career was going to be limited, by accepting my mom’s challenge to run in a local race. With only soccer, basketball and one mile around the local block or treadmill as training, I ran 21:15 in basketball shoes and a heavy sweatshirt to finish 2nd overall for the women. After some thought, I opted to join the cross country team, which ended up being a fabulous decision. I couldn’t believe how much fun one could have while running. This was the only sport I knew of in which you could literally have an hour long conversation with your best friend, soak up some vitamin D (or rough it through an ice storm), and somehow “effortlessly” get up to 8 miles covered; no equipment required beyond shoes! The hard workout and race days you obviously didn’t talk, but you walked away with the greatest sense of accomplishment and a boatload of endorphins to bring you back for more. 2 months after that initial 5K, I finished 27th in the D1 State meet, with the next logical step to run collegiately. 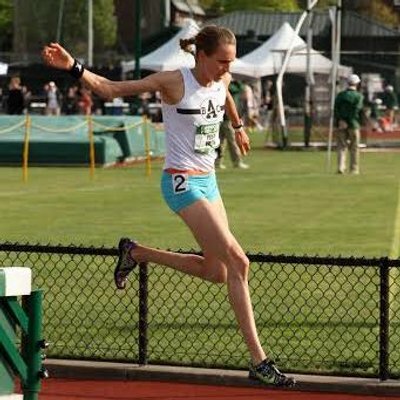 I became an 11 time All American at Wisconsin La Crosse, specializing in the 3000m steeplechase (winning an NCAA III Championship in 2004). When collegiate eligibility ended, I only saw it as a beginning to a lifelong sport. With age I have only gotten faster, with my most recent PR being a half marathon (5 weeks pregnant!) in 1:18:07. I have been a heavily involved member of various elite and local level teams across the country including those in Indiana, Virginia, and multiple clubs here in the Portland metro area. My experience working retail at various run specialty stores led to a tech rep position with Saucony, giving me additional outreach into the run community. I also gained valuable race management experience working with the Rock ‘n’ Roll series in Portland. 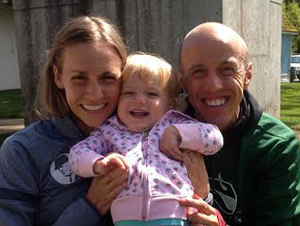 Since I met my husband Alan in 2007, it has opened up more opportunities for me to see into the professional side of the sport, as he competed 11 years for Nike (currently holds the American record in the mile) and more recently in triathlon. I continue to train and race at a high level on the roads, cross country course or track; with recent accomplishments including a 9th place finish at US Nationals in the steeplechase (while my daughter Joanie was only 11 months old) and breaking the Guinness World Record in the 10K pushing a baby jogger (note the record has been broken, but I plan to challenge this again after my 2nd daughter arrives - due this September). Aside from loving the physical challenge that running offers, as mentioned, I have an even greater love for the social element it provides. From my first season on, I became a team leader and knowledge seeker. This combo led to naturally becoming a coach. To make up for lost time coming into the sport “late” at age 17, I originally spent endless hours reading books, websites, and picking the brains of every coach and “real” runner I crossed paths with. Throughout the years working with many coaches, my own training experiences have given me great insight and a valuable tool on what works and does not, along with being a witness of my husband’s quest for getting the best of his body as a professional runner. Our family lives and breathes running, and naturally I want to share this wealth of knowledge with you! 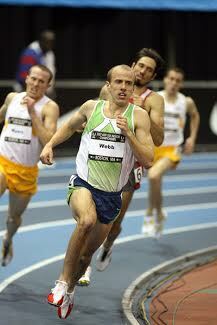 I have coached runners at the group and individual level – including all abilities. I get that not everyone can find the time and live the lifestyle of the elite runner, but that should never be a reason not to seek to become the best “present day you” as a runner! Currently I am an assistant cross country coach at Westview High School, lead a run group from the Nike headquarters campus, and offer individual coaching on the side. With extensive experience working at running camps, my dream is also to one day operate a camp with my husband. Who really needs a running camp though if you happen to live in the Portland area and have access to be a part of a training group!? I can’t wait to meet you, hear about your goals, and help you achieve them!! Check out our training pages and look for some great options coming soon this fall to get you ready to run confidently toward your goals!